Bu-GAWK! That’s the sound I make when I think of the many different things I wish I could do, but I’m to scared to do. I wish I was fearless, but I’m not. I’m a big chicken. Todays Listable Life: 5 things I wish I had the guts to do!! 5. Skydive. 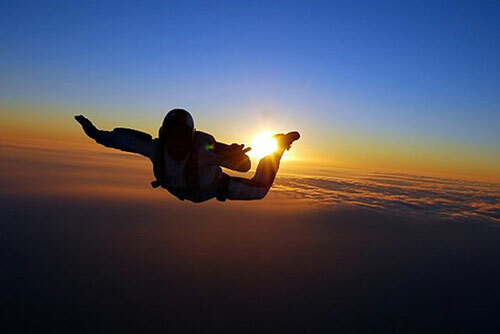 I seriously want to skydive. Like, really bad. SO stinkin scary!! One day, I am going to get the guts enough to do it. 4. Mountain Climbing. While we are on the topic of adventure, I so would love to learn to mountain climb, but I am sure that I would fall to my certain death. 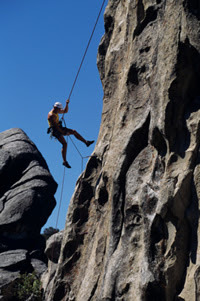 I am TERRIFIED of heights, so why the heck do I want to mountain climb? Or skydive? Something is seriously wrong with me. I think I just really want to overcome that fear. 3. Get a tattoo. I HATE needles. I’m a nurse and I have no problem at all stabbing you with a needle, but talk about putting a needle in me, and I could just die. 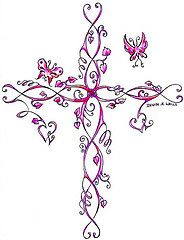 I would love to have a tiny little tattoo, (and I mean tiny), on my foot, of a cross. I have always said that if I ever get a tattoo, I would have my dad design it. He’s quite the artist! But as of now, I am way to chicken. 2. Cut my hair short. I did it last year and it was a disaster. I’m a huge fan of short hair, but I just can’t figure out how to style it. When I get it cut, my stylist does an amazing job and I walk out of the salon with fabulous hair. But somehow, I can never get it back. I have zero talent when it comes to hair and I wish I could just find my soulmate haircut! This totally could have been my list….except I'm pretty sure I'll never get the guts up to actually skydive or rock climb or tattoo myself – but they have ALL crossed my mind. Thanks for linking up! HAHA I love your chicken sound!! I wish I could figure out short hair too. When mine's above my shoulders I swear it goes crazy…can't do a thing with it! I'm pretty sure my hair goes crazy at all times, no matter what length it is ! haha!! I want to skydive and climb mountains too. But I think the fear would get the best of me! I've cut my hair short twice in my life, and I loved it. Until the next day when I wanted it long again LOL. So I guess I'm a fan of your long hair! Thats how I am too! As soon as I chop my hair off, I want it long again. And as soon as its long, I want it short lol! God didn't give us a spirit of fear . . . then again He didn't tell us to get in big metal birds, fly so many thousands of feet in the air, and then jump hoping that a small parachute would slow our fall down, LOL:D But God wants us to enjoy our lives here. I hope that you find the strength to step out and try some of the things you want to do. If it were me, I would skydive before mountain climbing to tackle the fear of heights head on!